Yesterday found an interesting fact while scanning GOLD with our favorite TTTB Trading System. GOLD has just broken TROUGH value of 27765 yesterday with the KRA line also pointing downwards. So in gold trend update its clearly a sell-on-rise till it again crosses the PEAK value at 28178. One picture worths 1000 words. Just check the screenshot below to understand how we have come to the conclusion of sell on rise in gold in analyzing gold trend update. Now, lets have a look on NSE stocks. 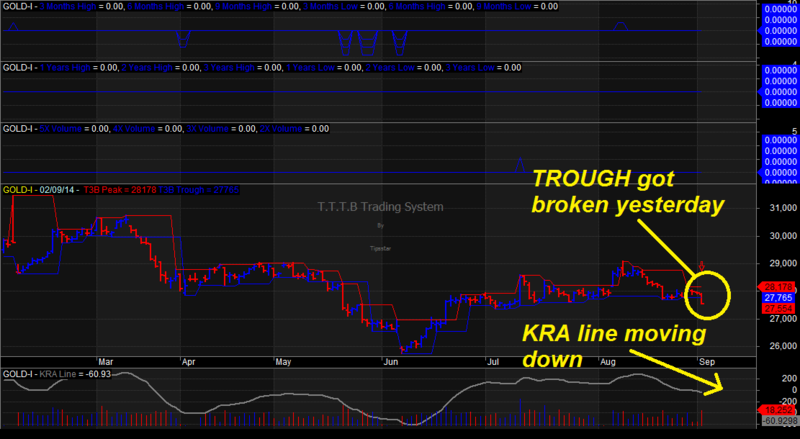 We found quite a few stocks that have broken PEAK with a very low KRA line in the TTTB scan in Amibroker. The 2 stocks found suitable in accumulation are VSTTILLERS and SWELECTES. Both have broken PEAK with KRA line rising from bottom. Check HIKAL is such a stock that has broken PEAK yesterday with low KRA line at 592 and taken enormous volume. We attached a screenshot. It is a potential upper circuit candidate. And zoom, when I am writing this post, HIKAL is already up by 3.80%. 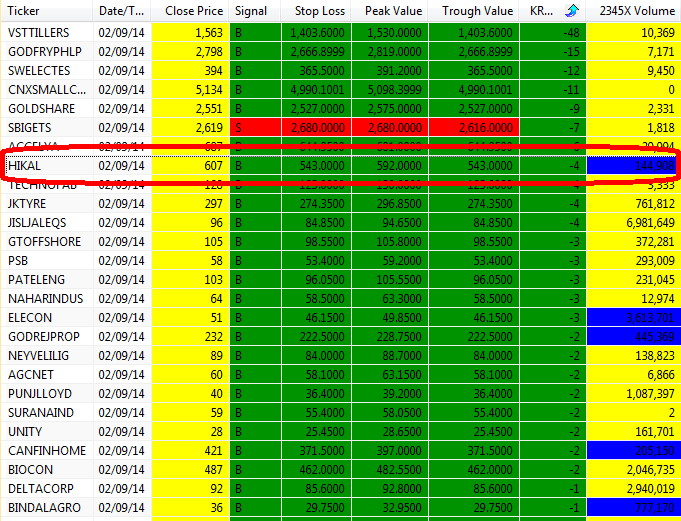 Buy triggered at 592 and current market price is 630. More upside on the cards in next few days. BUY, BUY, BUY in dips. How to get TTTB Trading System in your Amibroker? Now TTTB Trading System is a bonus with Trend Blaster Trading System. For instant access click here. To know more on TTTB Trading System and to access TTTB Trading System guide, please click here. Check the video here to know how to trade TTTB Trading System. I need tttb can u cal me once n explain 9945495454….